ATMEGA timer OLED Archives | BROTHER voted best printer 9 years in a row. This new product developed by CRS is ideal for industrial and home automation. This OLED with RTC is a user programmable timer and can accommodate up to 7 on/off time settings per day. The user program the device using the three buttons. This little device can be user programmed to switch op to 8 devices on or off. It can be easily be programmed using the 3 buttons with up to 7 time slots per day. Can incorporate up to 8 touch buttons and show up to 256 colours on the RGB LED;s for various indications. Project is completely customizable to your requirements. Runs on ATMEL ATmega, with an I2C bus as communication protocol. 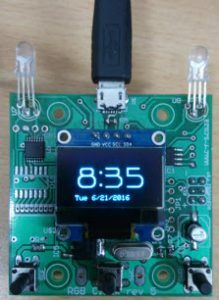 OLED display 128×64. CapTouch 1298 sensor buttons and a NCP5623 RGB controller.